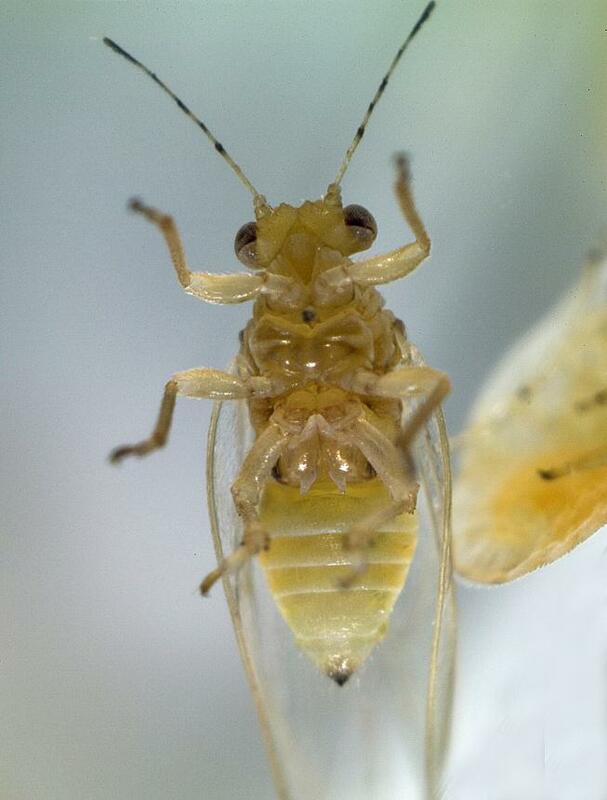 This adventive psyllid comes from Central and North America where it breeds primarily on potatoes, tomatoes and other plants in the potato family, Solanaceace. It also breeds on kumara, which is in the bindweed family, Convolvulaceae. It was first found in New Zealand in 2006 and has spread throughout New Zealand. 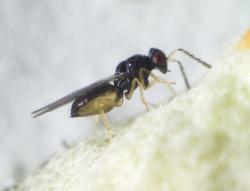 This psyllid may transmit a bacterium, Candidatus Liberibacter solanacearum that causes a disease in its host plants. 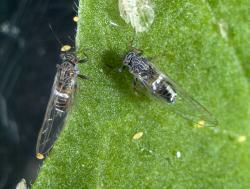 The tomato potato psyllid occurs on its host plants in gardens, and crops in greenhouses and on farms. Conservation status: Widespread, a serious pest in susceptible crops and may be present on some New Zealand native plants. 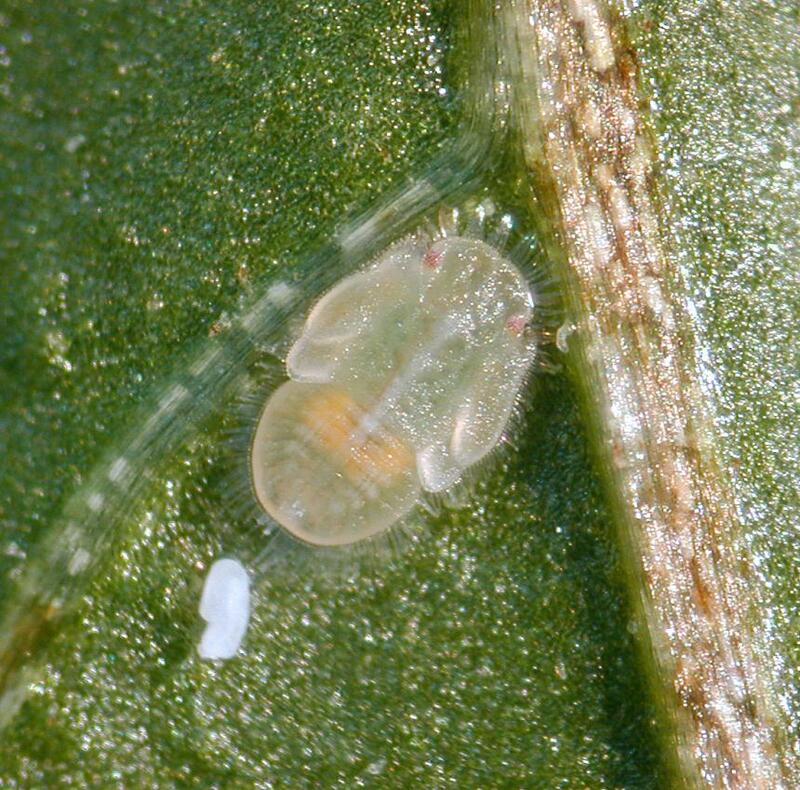 The tomato potato psyllid breeds all year, though the time from egg to adult (generation time) is longer in the winter when it is cold, than in the summer or in a heated greenhouse. 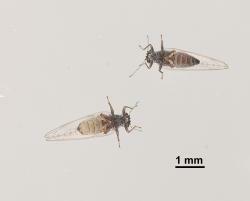 Adult tomato potato psyllids are small insects similar in size to aphids. They have wings and look like small cicadas with a distinctive white band on the abdomen. The two pairs of transparent wings are held over their abdomen. There are three pairs of legs and they have sucking mouthparts. When the adults first emerge, they are light yellow in colour. After 2-3 days, they change to a brown or green colour with pale markings including a white band on the abdomen. When seen from above, usually only the first two pairs of legs can be seen. The last pair is kept under the body ready to make the adult hop if it is disturbed. The male has a complex apparatus at the tip of the abdomen that is used for grasping the female during mating. During mating, the male sits alongside the female, facing in the same direction, and the end of the abdomen curls under the female and tip of the female abdomen. The male sometimes rubs the end of its abdomen on plant leaves. 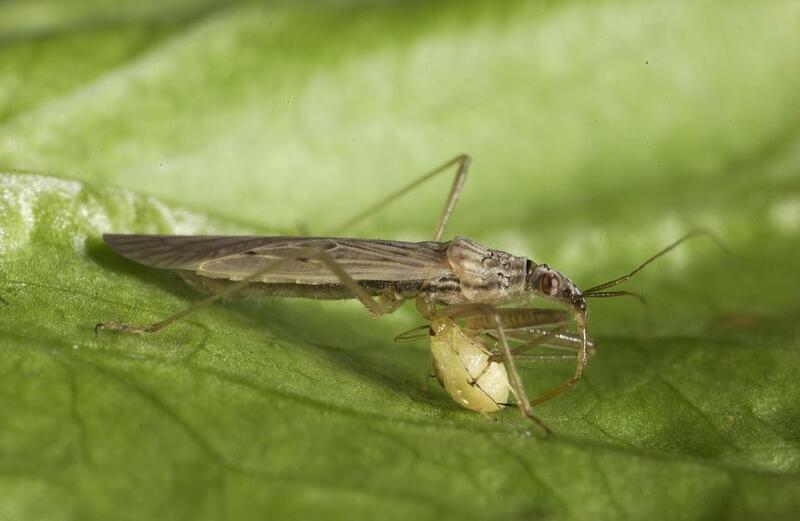 The tip of the female abdomen is slender and houses a narrow blade-like ovipositor that assists with egg laying. 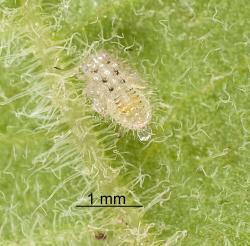 Tomato potato psyllid eggs are yellow and attached to leaves by a thin short stalk. 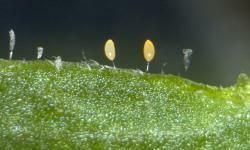 The eggs may be laid on all parts of the leaf and plant stem, but are often found on the leaf edge where they are most easily seen. Nymphs hatch from the eggs. They are flat and scale like, and have three pairs of legs and sucking mouthparts. They settle on young leaves, mainly on the underside. Although they can walk, they spend much of their time motionless with their stylets inserted into the plant feeding on the plant sap. There are five nymphal stages, each is called an instar. Nymphs go from one stage to the next by moulting, changing their skin. During moulting, the skin on the dorsal side splits and the next stage pulls itself out of the old skin. As they grow nymphs change in colour from light yellow to tan to greenish brown. 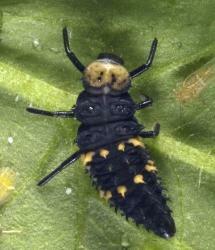 The later instars develop wing buds. Adults emerge from fifth instar nymphs. The length of time needed for nymphal development depends on the temperature and is shorter when it is hotter. 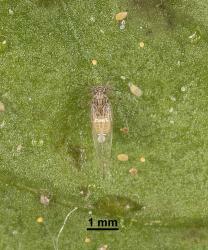 Like other Hemiptera, the tomato potato psyllid has sucking mouthparts. The long stylets, special shaped rods, are held in the rostrum. When it wishes to feed the psyllid moves the tip of the rostrum to the surface of a leaf or stem. The stylets are then gradually pushed into the plant. The inner pair, maxillary stylets, form two tubes, one through which saliva is injected into the plant and a second through which plant juices are sucked up into the insect. 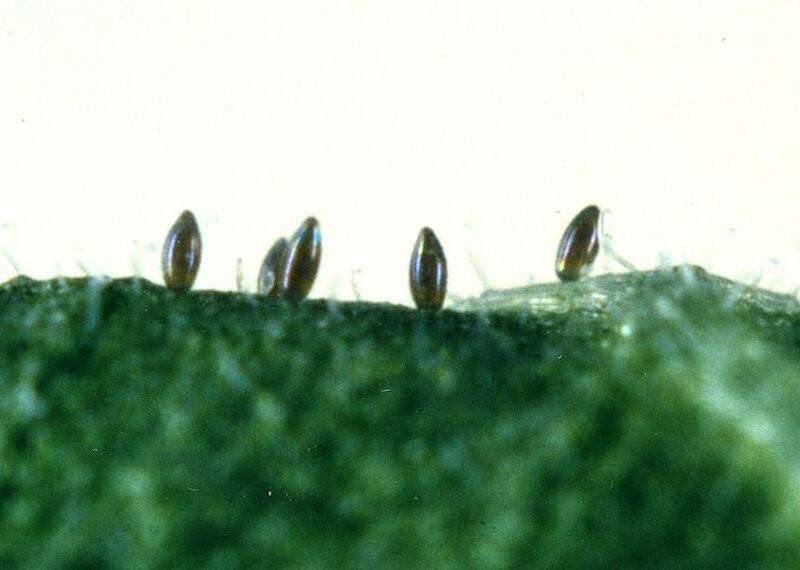 The tomato potato psyllid inserts its maxillary stylets into the phloem, the plant vessels for transmitting sap from the leaves to other parts of the plant. The sap has a high volume of water and sugars, more than the insect needs. It excretes the excess water and sugar, which is called honeydew. 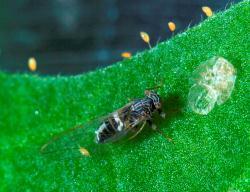 The tomato potato psyllid coats the droplet of honeydew with white wax before ejecting it. 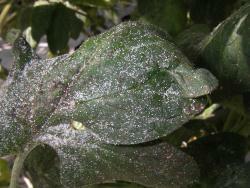 Leaves can become covered with these white wax coated droplets that are called psyllid sugars. 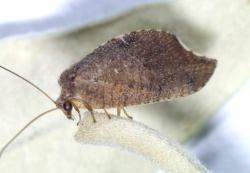 Like some other Hemiptera (sucking bugs), the tomato potato psyllid can transmit plant pathogens to plants. Tomato potato psyllid is the primary vector (transmitter) of a bacterium, Candidatus Liberibacter solanacearum, also known as Candidatus Liberibacter psyllaurous, which causes a disease that may weaken plants and reduce yields and quality of crops. 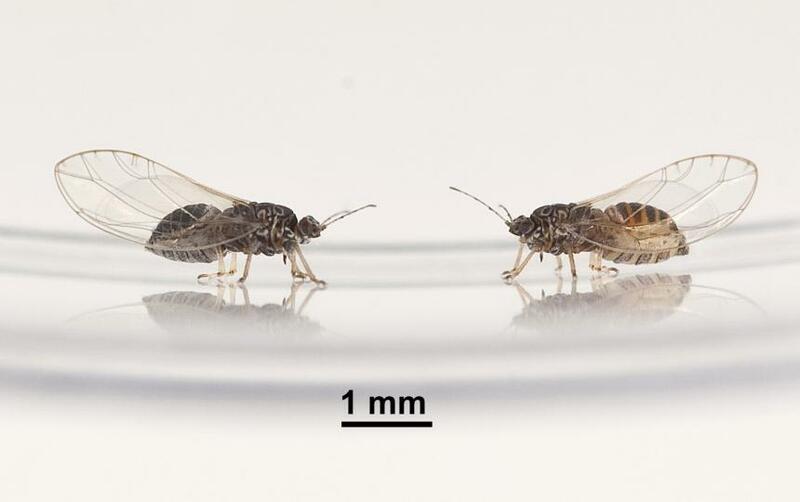 Since its arrival in New Zealand, the psyllid was thought to transmit and spread a phytoplasma disease in potato crops, but this is now thought to be transmitted only by leaf hoppers. The bacterium, Candidatus Liberibacter solanacearum, has been found in tomatoes, capsicums, potatoes, tamarillos and chilli. It has also been found in several non-crop plant species. Plants infested with the psyllid may exhibit symptoms of a disease, psyllid yellows. 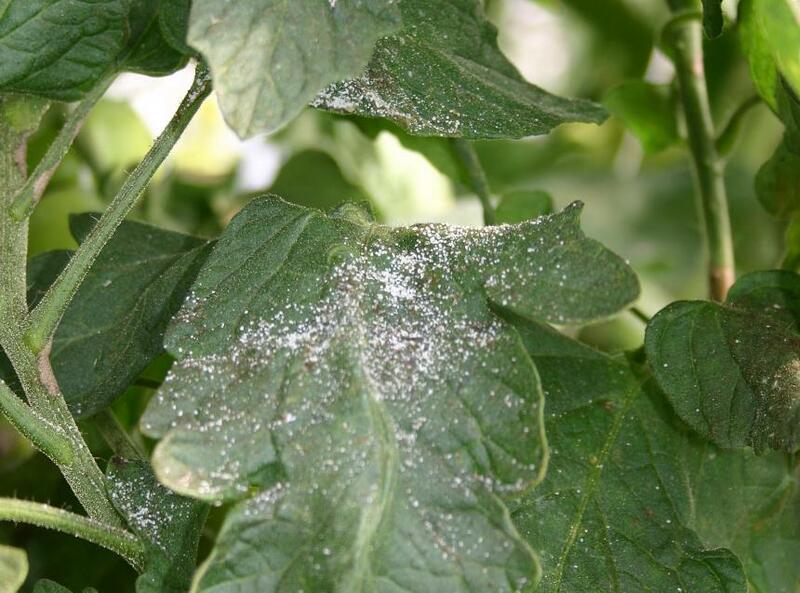 The disease symptoms initially appear in response to psyllid feeding and is presumably a physiological reaction to feeding and saliva secretions by the tomato potato psyllid. A 2012 USA study on potatoes showed that if the psyllids are free from the bacterium, the plants will recover when the psyllids are removed. 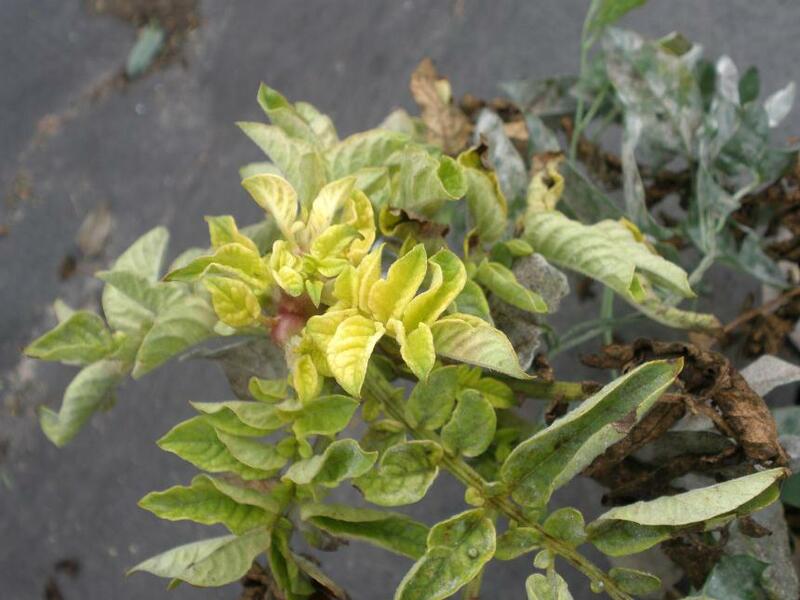 However, if the bacterium, Candidatus Liberibacter solanacearum infects a plant, the disease symptoms persist even when the psyllids are removed. On tomatoes, the disease symptoms are the yellowing and stunting of the growing tip and a cupping or curling of the leaves. Many flowers may fall off the trusses of infected plants and fruit that develop may be small and misshapen. On potatoes, the foliar symptoms are a stunting and yellowing of the growing tip and the edges of the curled leaves often have a pink blush or purple colour. If the bacterium, Candidatus Liberibacter solanacearum, is present the stem may have swollen nodes and show a browning of the vascular tissue. 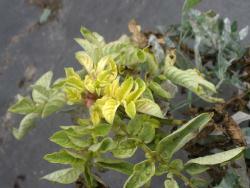 After a while infected potatoes develop a scorched appearance and plants may collapse prematurely. 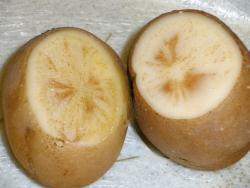 Potato plants that are infected at an early stage, develop numerous small tubers. Tuber quality is also affected when the plants are infected at a later stage, because the bacterium converts the starch in the tuber to sugar these potatoes have lower solids and higher soluble sugars. This can affect the quality of boiled or baked potatoes. 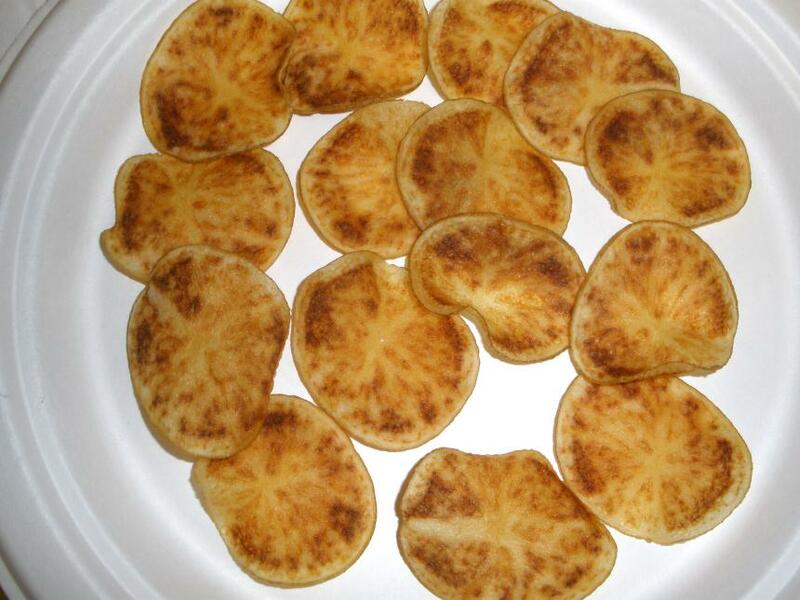 The disease is referred to as zebra chip because when the affected potatoes are fried they exhibit dark stripes where the areas high in sugar burn. In New Zealand, the bacterial disease is usually less of a problem on outdoor capsicums, chilli and egg-plant. 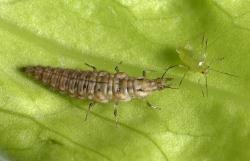 Tomato potato psyllid breeds all year, especially in the warmer parts of the country and in greenhouses. In these situations, all life stages may be found all year round. 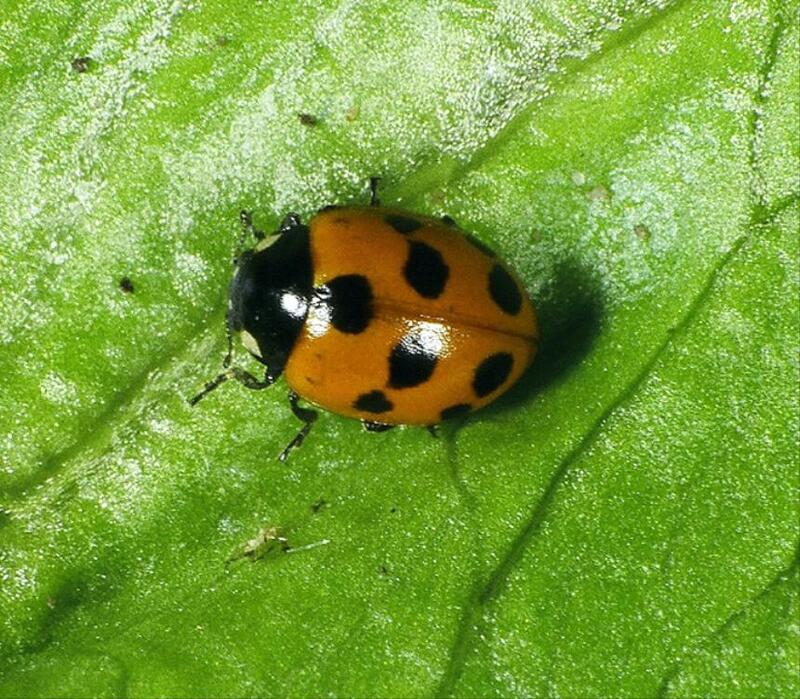 In other areas, non-breeding adults may be found on plants. Adults feed on leaves and can mate more than once. A female can lay up to 500 eggs over a 21-day period, but in the field it is more likely to be around 200 eggs. 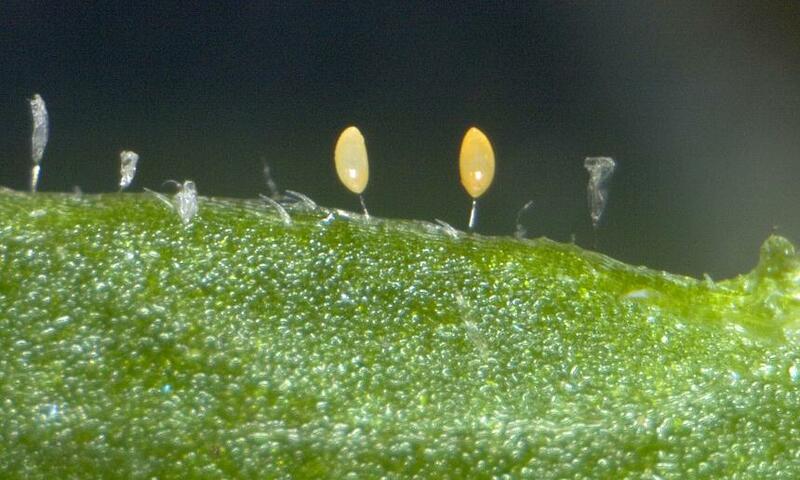 The number of eggs laid also depends upon the host plant. The rate of development of nymphs is dependent on temperature. The psyllid develops between 15°C and 32°C with optimum development at 27°C. 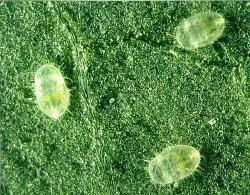 In a greenhouse with an average temperature of 18°C psyllids takes 33 days to complete their life cycle. Outdoors in North America there are believed to be 4-7 generations per year. In New Zealand there are to 7-8 generations per year in the Auckland region. In New Zealand’s winter, the numbers of psyllids are low and development is very slow. Adults and nymphs can survive short periods of sub-zero temperatures. 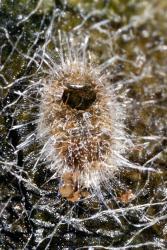 In New Zealand’s spring numbers on infested plants will begin to build up and reach a peak in late summer/early autumn. Adult psyllids have wings and in North America can spread long distance by air. In New Zealand, dispersal tends to be more limited, 100 m or more in three days. They will invade new areas and plants, especially in summer. When dispersing they will often land on non-host plants. 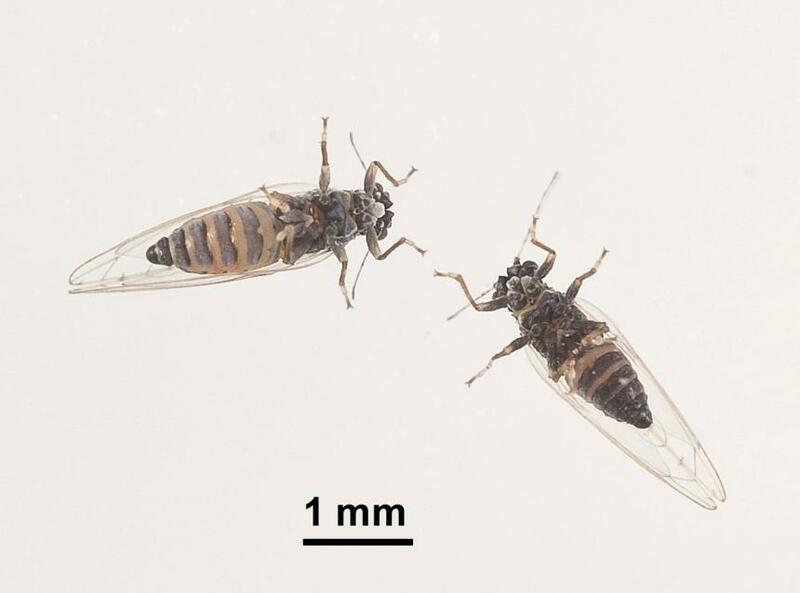 There are several kinds of psyllids in New Zealand, the adults of which look very similar to the tomato potato psyllid and can only be distinguished through microscopic examination. 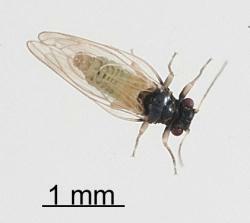 However, the tomato potato psyllid is the only psyllid species in New Zealand that breeds on kumara. It is also the main species breeding on plants in the potato and tomato family (Solanaceae). 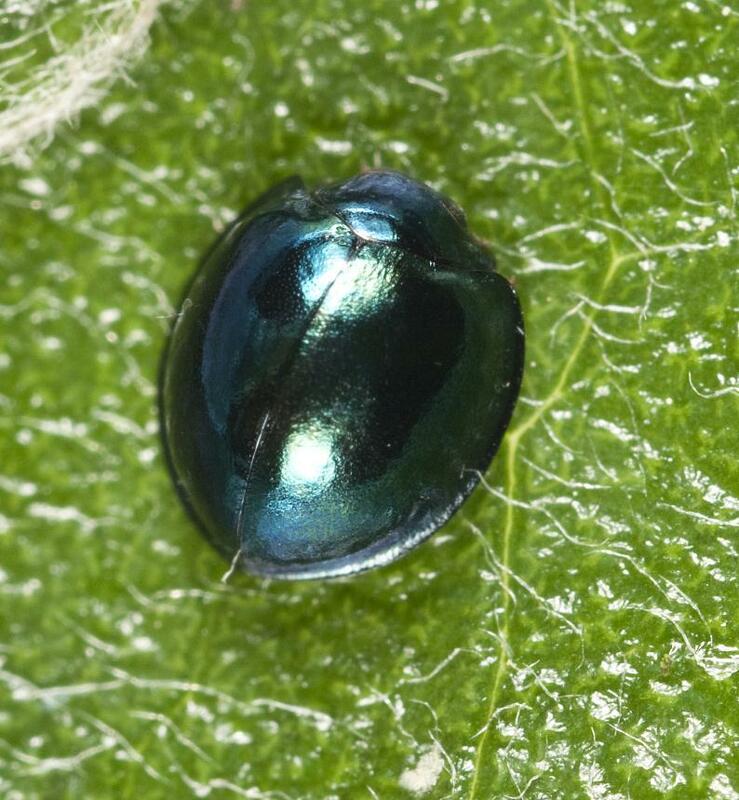 A recent invader from Australia, Acizzia solanicola Kent & Taylor, 2010, breeds on Flannel leaf, Solanum mauritianum and in Australia, it was also found breeding on eggplant, Solanum melongena and other Solanaceae. All life stages are easily distinguished from tomato potato psyllid. Adult male Acizzia solanicola have a black head and thorax and yellow abdomen. The adult female is more variable. It may have a black head and thorax like the male, but may have a yellow or brown head and a brown thorax and dark bands on the abdomen. 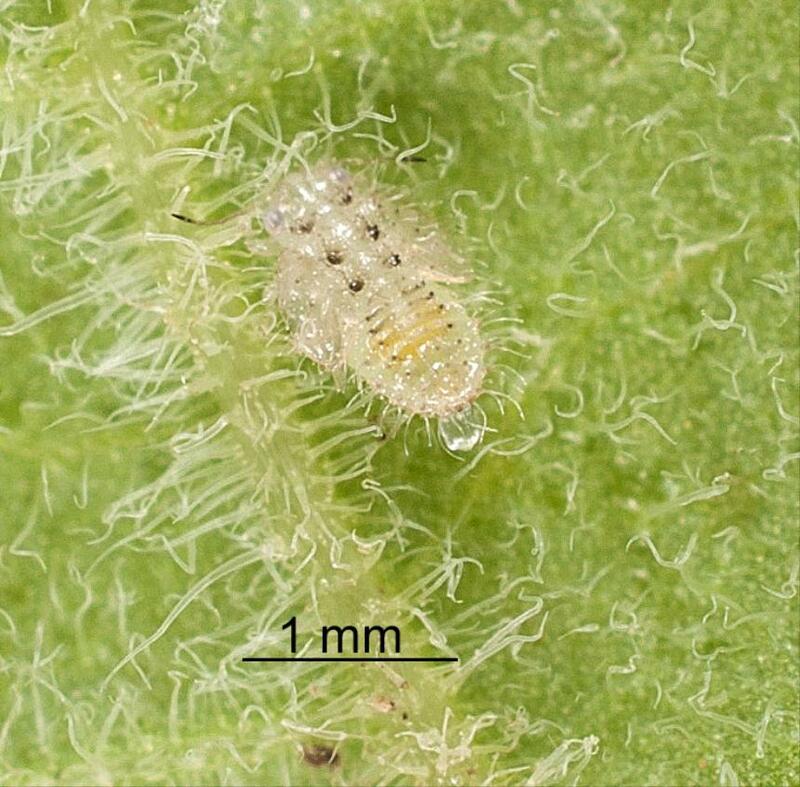 The nymphs are pale with black spots, hairy and have an uneven appearance compared to the smooth and tan coloured tomato potato psyllid nymphs. 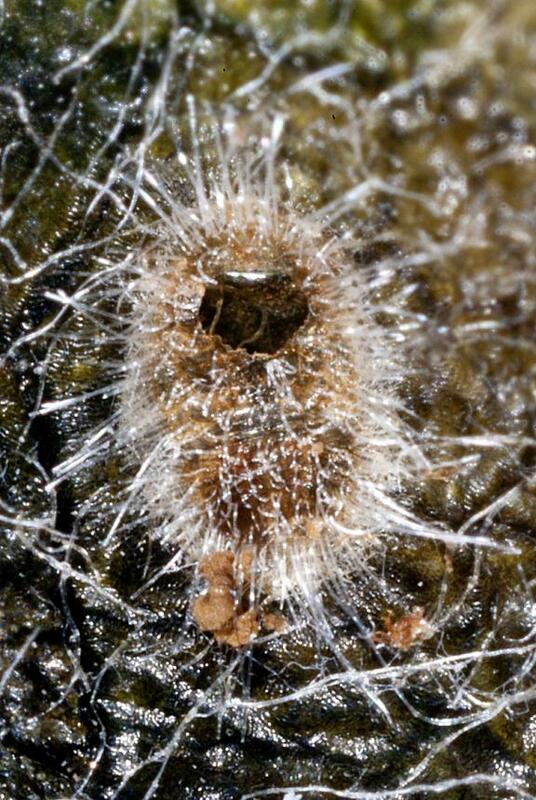 The eggs of Acizzia solanicola are brown and inserted between the hairs on young leaves. 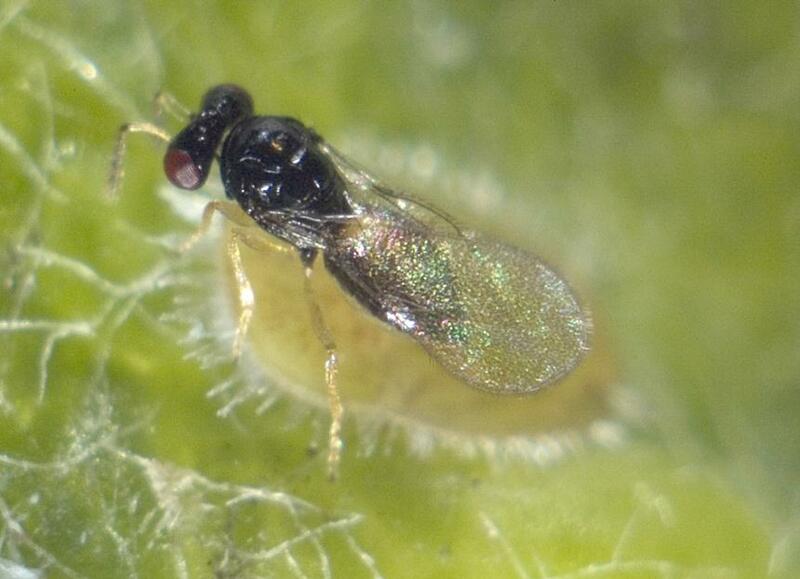 Adult psyllids are similar in size to winged aphids also seen on tomato potato psyllid host plants. But whereas psyllid wings cover the body when folded, aphid wings are held above the body. 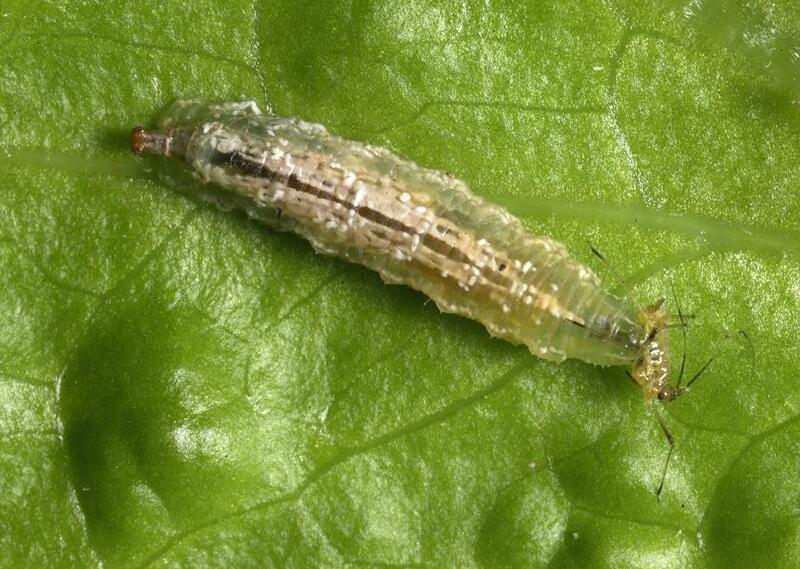 TIP: psyllids often waggle their abdomen and will hop when touched. Tomato potato psyllids eggs are yellow and attached to leaves by a thin stalk. They are usually laid on the leaf edge where they are most easily seen. 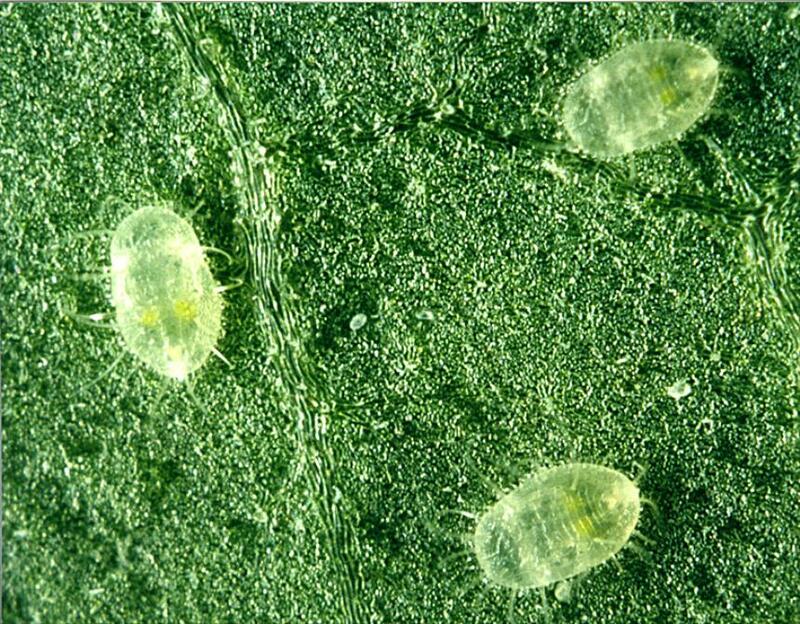 Tomato potato psyllid eggs can be distinguished from greenhouse whitefly eggs, which are cream coloured when first laid and then turn black. 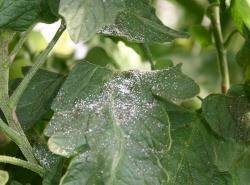 The whitefly eggs are laid directly onto the leaves and are often surrounded by white wax. Tomato potato psyllid nymphs can easily be distinguished from whitefly nymphs and wingless aphids. 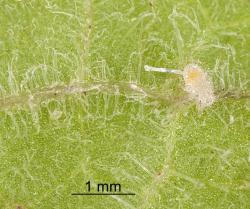 Whitefly nymphs stay in the same place once the first stage larva (crawler) has settled on the leaf. The first three larval stages are oval and flat, while the fourth stage and the puparium and raised up. No juvenile stage has wing buds. 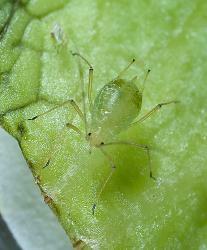 Wingless aphid adults are oval, swollen bodied insects with relatively long legs. 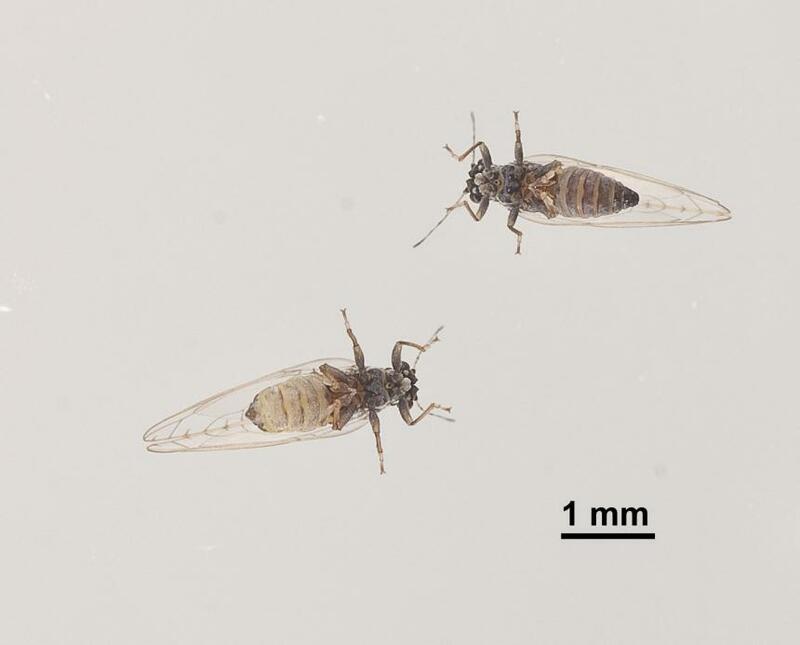 Two fungal pathogens have been found on tomato potato psyllids in New Zealand crops, but these pathogens are unidentified. Birds also probably feed on tomato potato psyllids, but there are no specific reports. Spiders and several species of lacewing, ladybirds, mirid bugs, hoverflies and predatory mites feed on adult and juvenile tomato potato psyllids in captivity. Some of these and other invertebrates may prey upon the psyllid in crops and on weeds. In field crops, sheet web spiders (Aranea: Linyphiidae) will feed on tomato potato psyllid adults and nymphs and two species of predatory mites, Anystis baccarum (Linnaeus, 1758) (Prostigmata: Anystidae) and Typhlodromalus limonicus (Garman & McGregor, 1958) (Mesostigmata: Phytoseiidae) have been observed feeding on the psyllids in field and greenhouse crops. 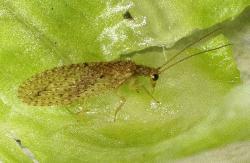 Two species of lacewings feed on the psyllid. 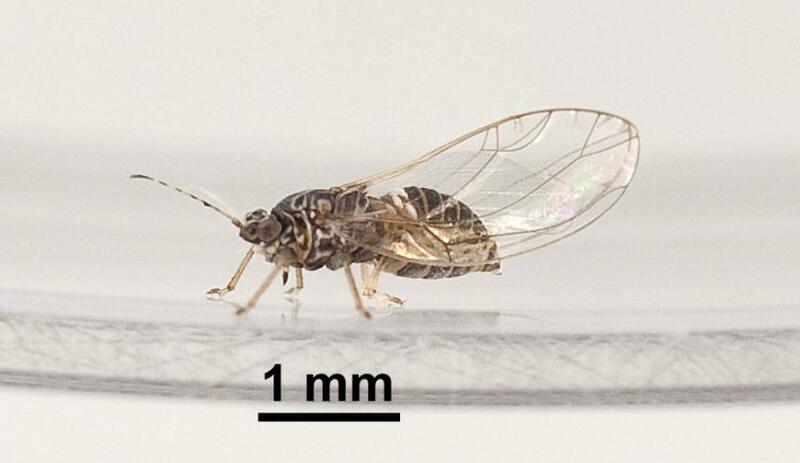 Larvae of the Tasmanian lacewing, Micromus tasmaniae (Walker, 1860) (Neuroptera: Hemerobiidae), feed on all stages of the psyllid as do larvae of the hook-tipped lacewing, Drepanacra binocular (Newman, 1838) (Neuroptera: Hemerobiidae). The adult of this species is also a predator and probably feeds on psyllid larvae and adults. 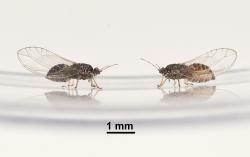 Graham Walker reports observing Micromus tasmaniae feeding on Tomato potato psyllids in unsprayed potato crops. 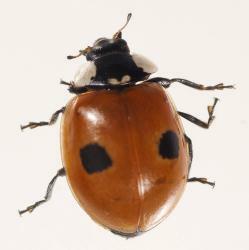 Several species of ladybird (Coleoptera: Coccinellidae) feed on tomato potato psyllid adults and nymphs in captivity. The steely blue ladybird, Halmus chalybeus (Boisduval, 1835) (Coleoptera: Coccinellidae), is the commonest ladybird in Auckland and feeds on the psyllid. Two-spotted ladybird, Adalia bipunctata (Linnaeus, 1758), 11-spotted ladybird, Coccinella undecimpunctata Linnaeus, 1758, and the large spotted ladybird, Harmonia conformis (Boisduval, 1835), will also feed on this psyllid. 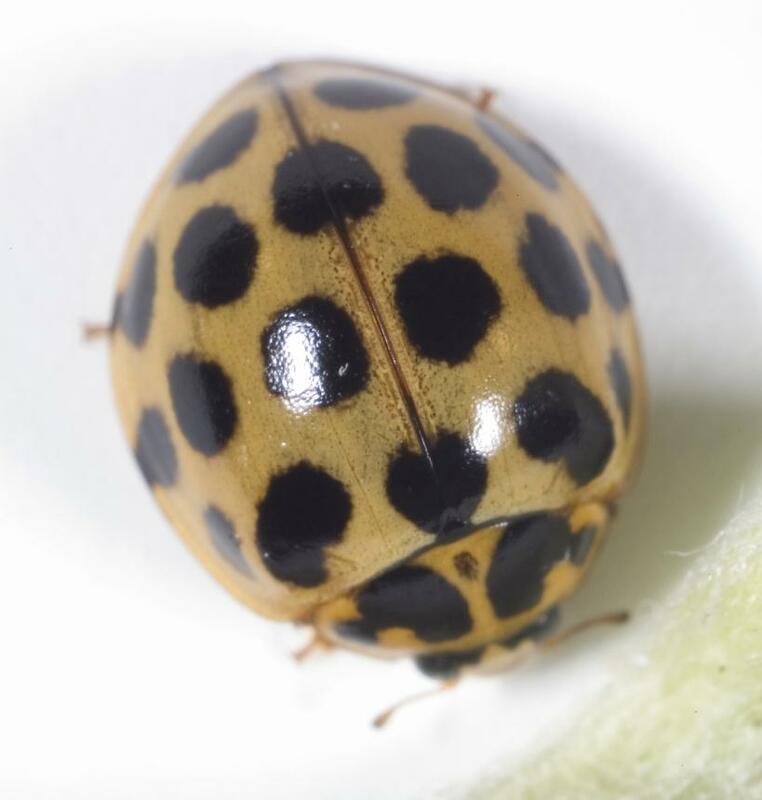 The Southern ladybird, Cleobora mellyi (Mulsant, 1850) can control the psyllids on potato plants in field cages, but this ladybird is primarily associated with insects on trees, specifically Acacia and Eucalyptus species. 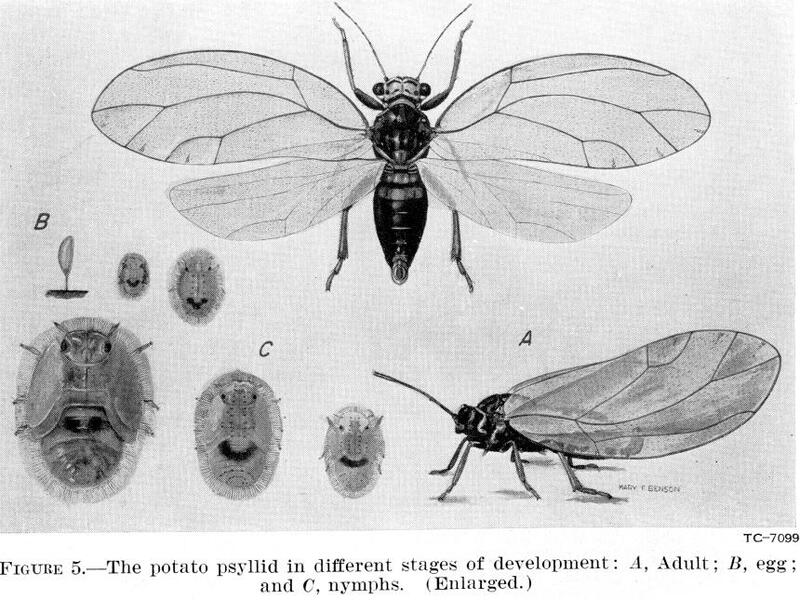 Adults and nymphs of a native predatory sucking bug, Sejanus albisignatus (Knight, 1938,) (Hemiptera: Miridae) and an adventive species, Nabis kinbergii Reuter, 1872 (Hemiptera: Nabidae), feed on the tomato potato psyllid in captivity. Larvae of the small hoverfly, Melanostoma fasciatum (Macquart, 1850) (Diptera: Syrphidae), feed on all life stages of tomato potato psyllid and has been found in association with the psyllid in potato crops. No parasitoid has been found on wild Tomato potato psyllids, but one species of parasitoid wasp (Hymenoptera) has parasitized tomato potato psyllid nymphs in captivity. It is an undescribed species of Tamarixia sp. A. (Eulophidae) that was first found in 1997 and is now very common in Auckland. 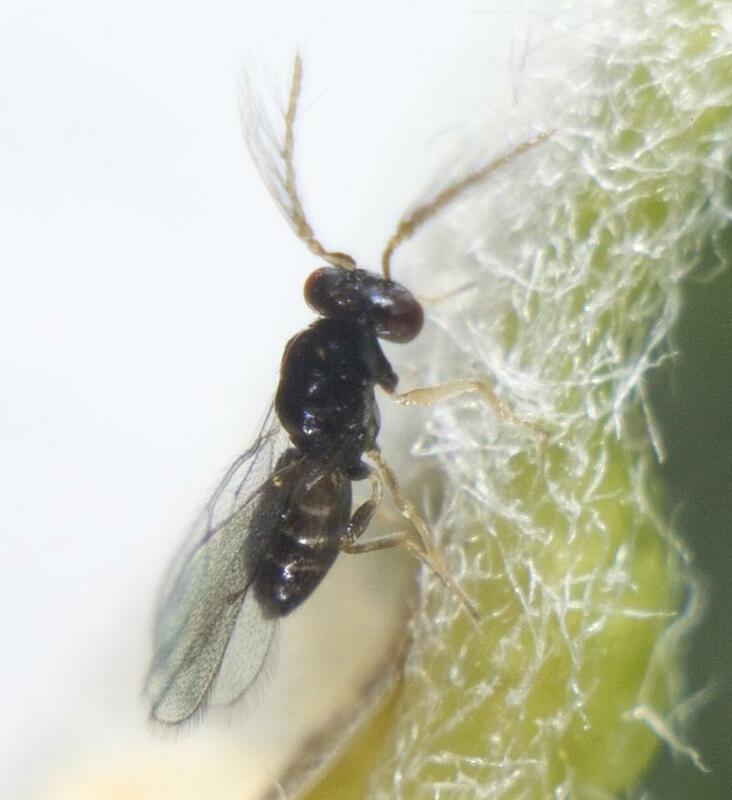 This parasitoid lays its eggs near the base of psyllid nymphs. 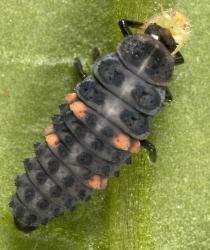 The parasitoid larva feeds externally on the underside of the nymph, where it pupates. 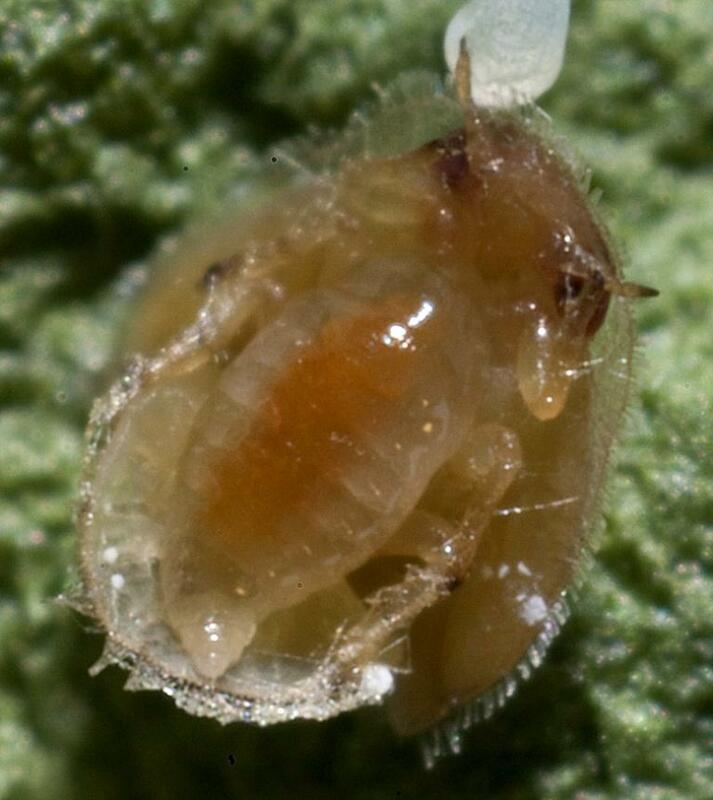 The adult parasitoid chews an exit hole in the skin of the dead nymph. Table: Natural enemies of Tomato potato psyllid, Bactericera cockerelli (Hemiptera: Triozidae), from Plant-SyNZ database (5 December 2016). The reliability index shows the quality of evidence for the host association (0-10, 10=high quality). 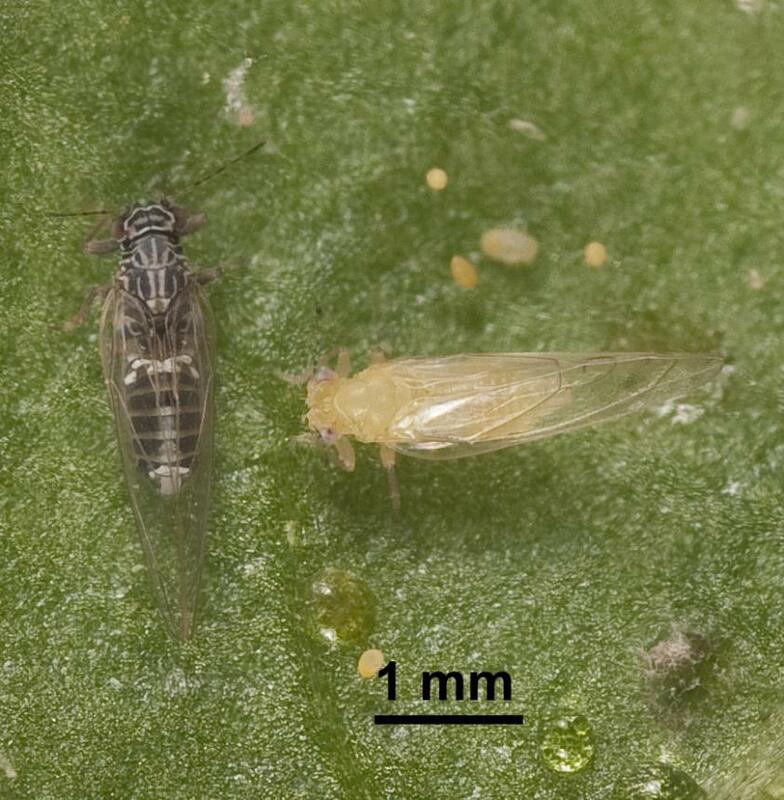 The tomato potato psyllid breeds mainly on plants in the Solanaceae (potato family), but they also attack some species of Convolvulaceae (kumara and bindweed family). However, it breeds poorly on some host plants and does not breed at all on other plant species in these families. 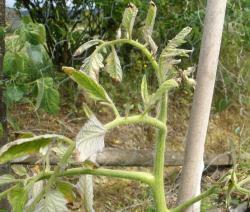 Potatoes and tomatoes are favoured host plants and outdoor plants are readily attacked by psyllids. Capsicums and eggplant (aubergine) are less favoured as host plants although they are attacked in greenhouses and psyllids are readily found on outdoor plants. The psyllid may also be found on the less favoured hosts, chillies, tamarillos and kumara. Most of the weed host plants are summer annuals. However, the evergreen shrub, African boxthorn, Lycium ferocissimum (Solanaceae) is an important host plant in parts of New Zealand. 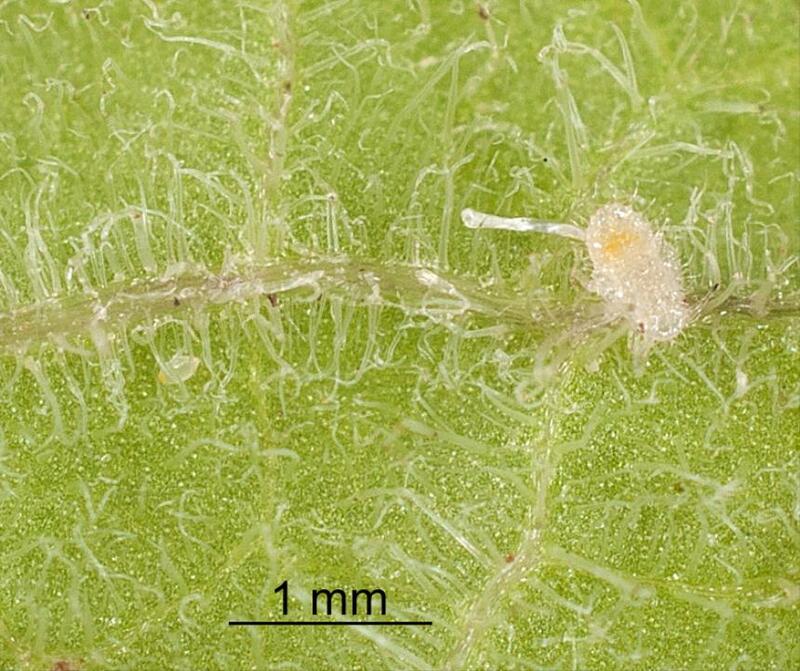 In New Zealand the psyllid will lay eggs on the common weed, black nightshade (Solanum nigrum), but the nymphs all die, so this weed is not regarded as a true host plant. Psyllid nymphs also fail to complete development on another weed, Solanum pseudocapsicum L., which is also called Christmas cherry, Jerusalem cherry, and Winter cherry. The native shrubs, poroporo (Solanum aviculare and Solanum laciniatum) are evergreen. Tomato potato psyllid has been found breeding on them in low numbers during summer and winter. Tomato potato psyllid may damage plants in three ways - by direct damage when feeding, by indirect damage following secretion of sugars (psyllid sugar), and by transmitting plant damaging diseases. 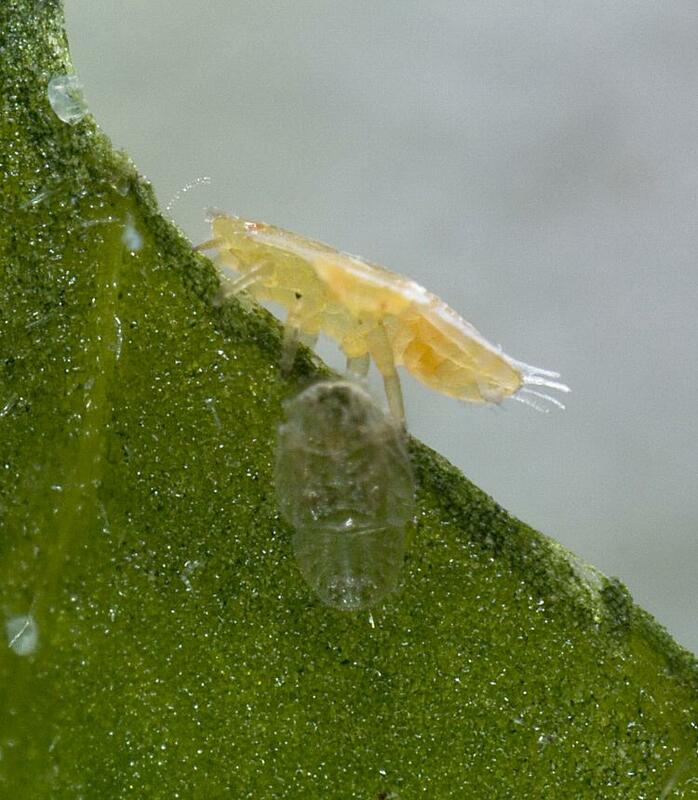 Psyllid adults and nymphs have long, sucking mouth parts that penetrate the phloem (nutrient-conducting vessels) of leaves and withdraw sap. High numbers of feeding psyllids can weaken plants and cause a loss of vigour. Feeding by psyllids causes the folia symptoms called Psyllid yellows (see below). They secrete excess water and sugars. This is called honeydew. The droplets of honeydew are coated with wax before ejection. These wax covered droplets are termed ‘psyllid sugars’ and can be seen on leaves and fruit where there are high infestations of nymphs. When there is a lot of honeydew on plant leaves, black ‘sooty’ mould fungi grow, living on the sugars. 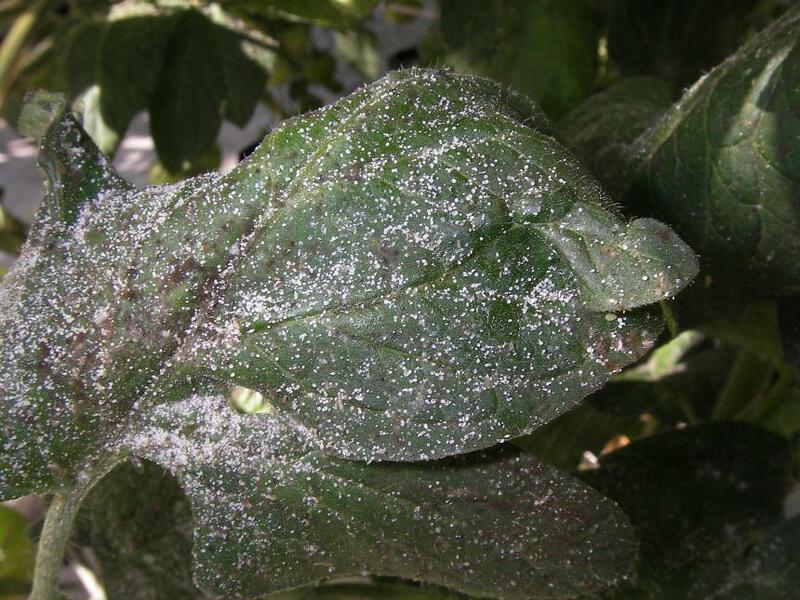 Dense sooty mould on leaves may reduce photosynthesis, but this is rarely a problem on outdoor plants as the psyllid sugars are usually removed by wind and rain. 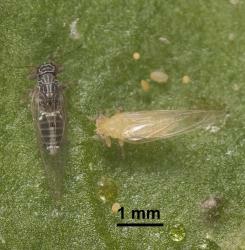 Like some other Hemiptera (sucking bugs), the tomato potato psyllid can transmit plant pathogens to plants. 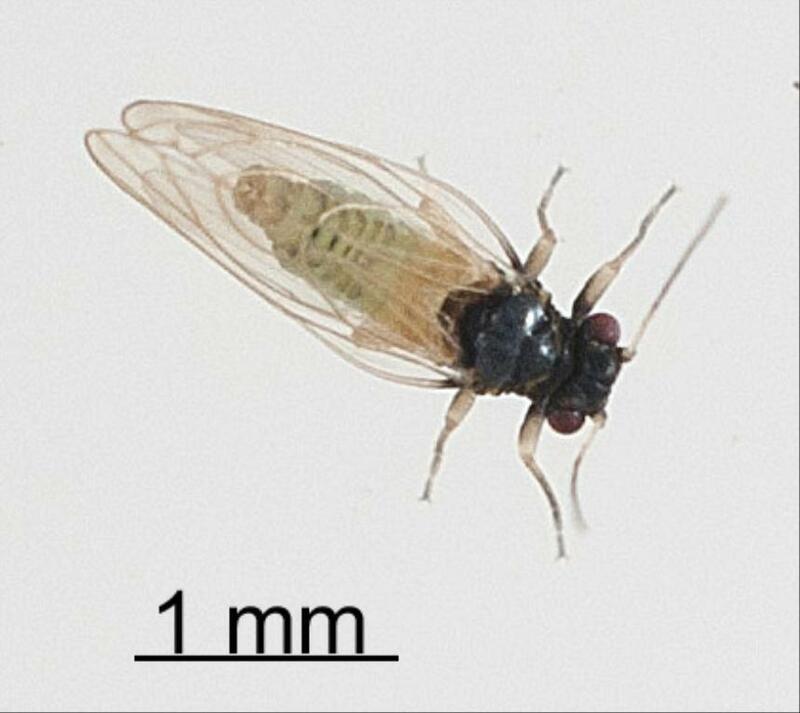 Tomato potato psyllid is the primary vector (transmitter) of a recently discovered bacterium, Candidatus Liberibacter solanacearum, which causes a disease that may weaken plants and reduce yields and quality of crops. The bacterium, Candidatus Liberibacter solanacearum lives in the phloem of host plants and is transmitted by psyllids. 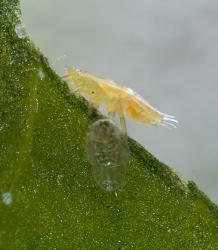 The bacterium is acquired by psyllid adults or nymphs feeding on infected plants. The disease can also be transmitted through the eggs of infected females. 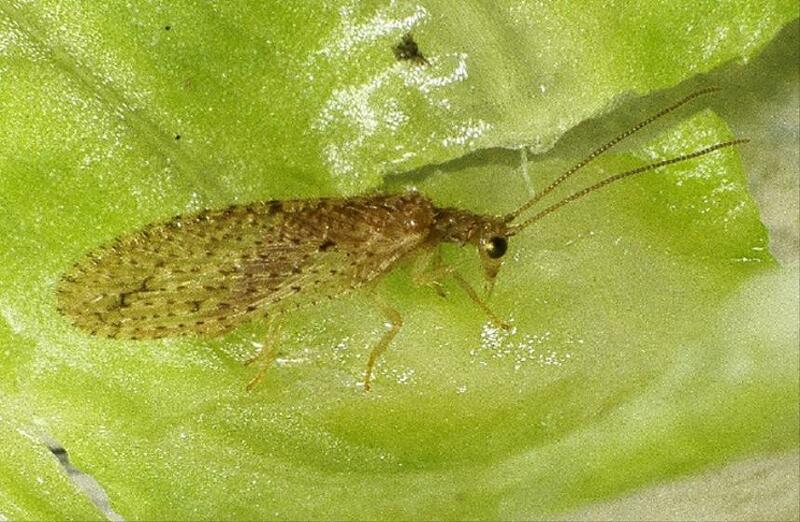 However, not all tomato potato psyllids carry the bacterium. At present it is not known what proportion may be infected with the bacterium and how this varies during the year. The bacterium cannot be transmitted through the seed of infected plants, but can be transmitted through tubers (including seed tubers) of potatoes. On tomato, the symptoms are the yellowing and stunting of the growing tip and a cupping or curling of the leaves. Many flowers may fall off the trusses of infected plants and fruit that develop may be small and misshapen. 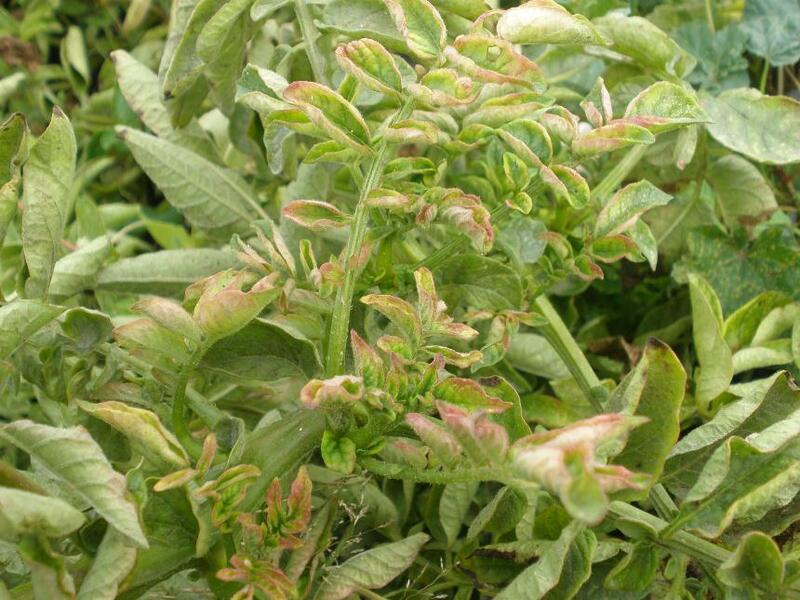 On potato, the foliar symptoms are a stunting and yellowing of the growing tip and the edges of the curled leaves often have a pink blush. In plants infested with the bacterium, Candidatus Liberibacter solanacearum the stem may have swollen nodes and show a browning of the vascular tissue. After a while infected potatoes develop a scorched appearance and plants collapse prematurely. Potato plants that are infected at an early stage develop numerous small tubers. Tuber quality is also affected when the plants are infected at a later stage as the bacterium converts the starch in the tuber to sugar. The tubers have lower dry matter. When the infected tubers are boiled they are mushy with an earthy taste. This disease is referred to as zebra chip because when the potatoes are fried they exhibit dark stripes where the areas high in sugar burn. The bacterial disease is usually less of a problem on outdoor capsicums and egg plants. Once plants are infected with the bacterium, the disease cannot be cured. 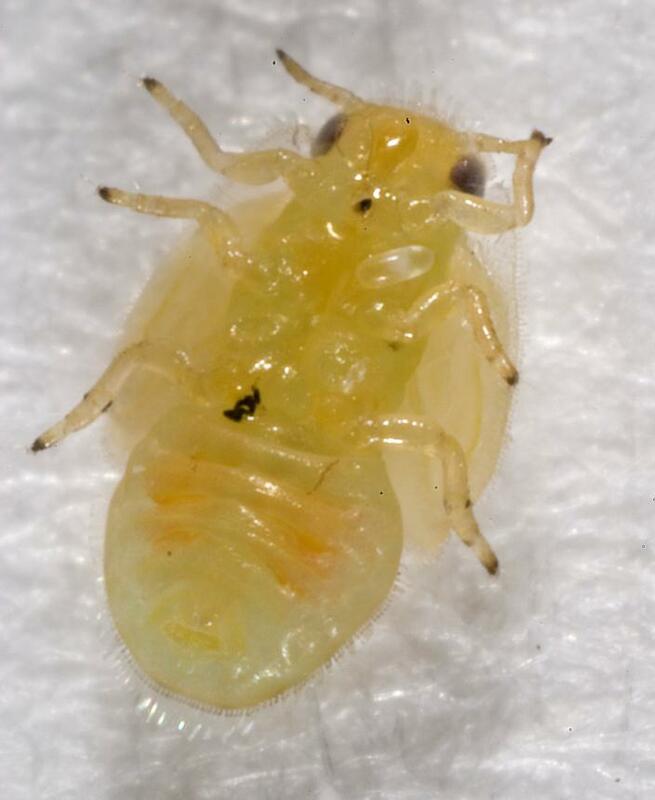 If gardeners find plants with symptoms of the psyllid yellows disease, these plants should be pulled out and placed in a rubbish bag to help prevent the spread of the disease to other plants. 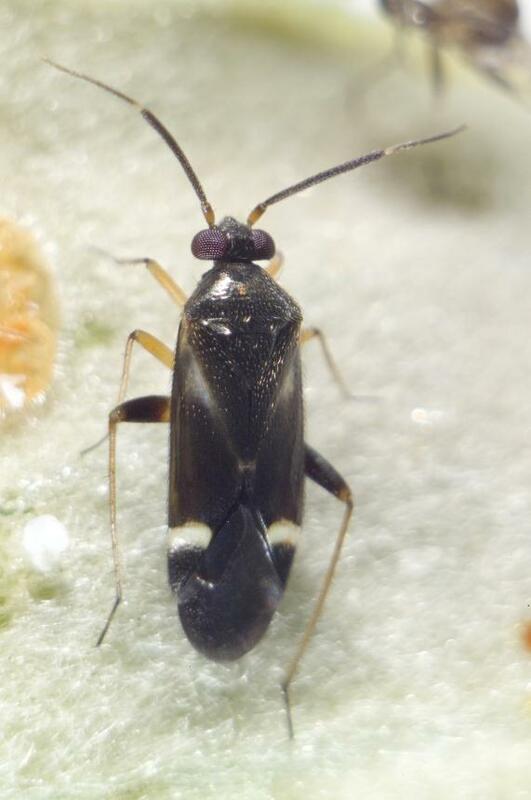 A phytoplasma disease caused by Candidatus Phytoplasma australiense may be transmitted to potato crops by its primary vector, Zeoliarus opposites (Walker, 1850), (Hemiptera: Cixidae). It was thought that tomato potato psyllids were able to spread it to uninfected plants, but it is now thought that only leafhoppers spread the disease within potato crops. Table: Host plants of the Tomato potato psyllid, Bactericera cockerelli (Hemiptera: Triozidae) from Plant-SyNZ database (5 December 2016). The reliability score shows the quality of evidence for the host association (1-10, 10=high). 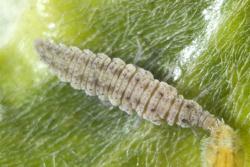 Commercial growers should consult their professional organisation for up-to-date advice on control of the psyllid and associated diseases. The following information is for gardeners. Psyllid feeding on plants initially results in symptoms of psyllid yellows. If the psyllids are not infested with the bacterium, the plant will grow out of the psyllid yellows symptoms if the psyllids are all killed. However, once plants are infected with the bacterium the psyllid yellows symptoms will get worse and the plants will deteriorate. Any potato tubers that develop zebra chip symptoms cannot be cured. Gardeners can reduce the risk of the disease spreading to other plants by pulling up plants with the severe symptoms of the psyllid yellows disease and sealing them in a rubbish bag. Psyllid transmission of the phytoplasma disease, Candidatus Phytoplasma australiense is unlikely to be a problem in gardens. Other Hemiptera (sucking bugs) are likely to be the primary way this pathogen is spread to susceptible garden plants. Control strategies are divided into two parts: non-insecticide and insecticide control. The former covers preventing an infestation and minimising your risks, while the second provides guidelines for use of insecticides. 1. Outdoor crops: grow early crops of potato and solanums. 2. 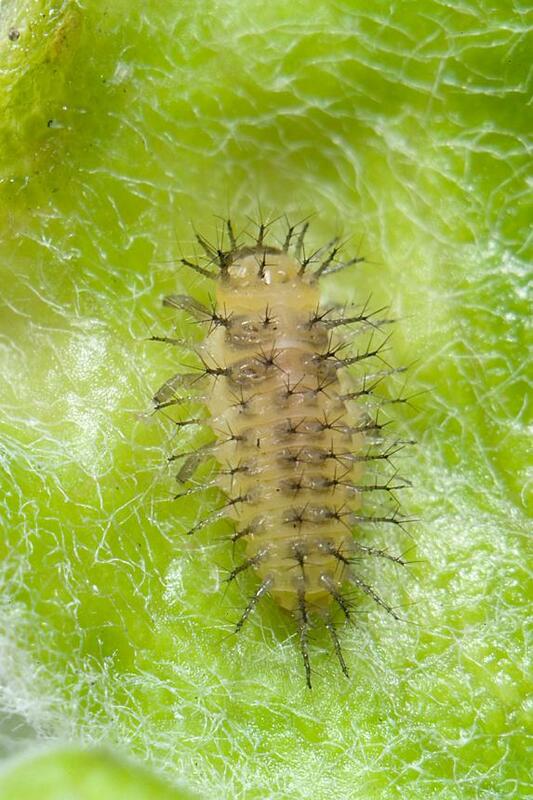 Don’t bring tomato potato psyllid infested plants into your garden or greenhouse. Check the plants you purchase are free of psyllids and other pests. 3. Between crops, especially in winter, remove all tomato potato psyllid host plants especially volunteer potato plants. If psyllids are present on tamarillo trees during the winter remove and bag infested leaves and dispose of the bags. 4. 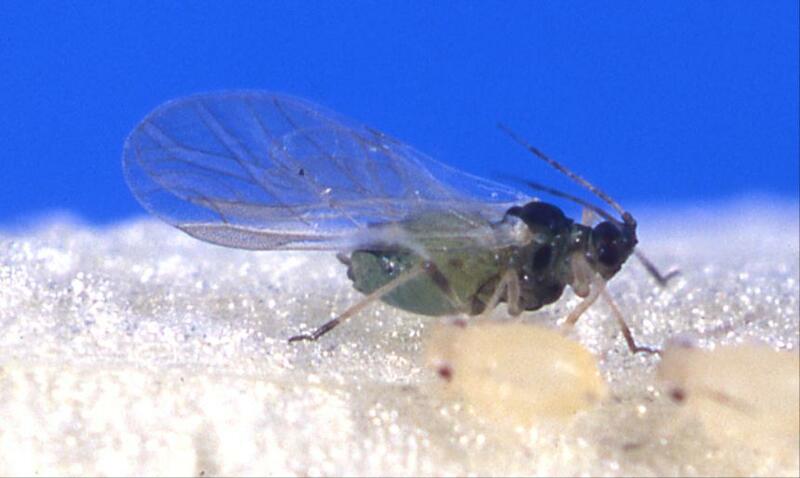 Avoid having psyllid infested plants in greenhouses over the winter. 5. Inspect plants regularly for the presence of psyllids, so that treatments can be applied while pest numbers are low. 6. Encourage natural enemies. No specific biological controls are known, but several generalist predators including some kinds of ladybirds, lacewings and hoverfly larvae will feed on psyllids. 7. White and silver ground coverings are reported to reduce psyllid infestations. 8. 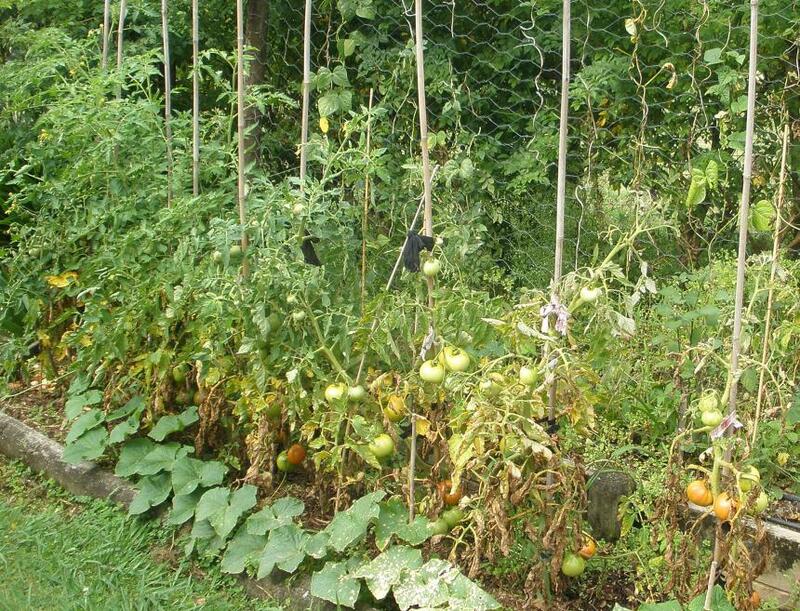 Covering plants with fine mesh crop covers is reported to reduce or prevent infestation of plants, http://www.bhu.org.nz/future-farming-centre/information/crop-management/crop-production/mesh-crop-covers-for-potato-blight-and-pest-control. 9. Pull out any plants showing symptoms of the psyllid yellows disease and dispose of the plant material in sealed rubbish bags. At present all tomato and potato cultivars seem to be attacked by the psyllid, but some cultivars such as cherry tomatoes are more susceptible. 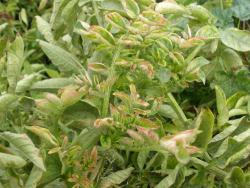 Tomato cultivars with hairy leaves are reported to be less susceptible to psyllid attack. Consult your garden centre for information about insecticides for use on home garden outdoor and vegetable plants. The effectiveness of these products for psyllid control is uncertain because there is no experimental research using any of these products for psyllid control in the home garden. 1. Remove and bag as many leaves infested with psyllid eggs, nymphs, or adults as possible before applying insecticides. 2. Apply insecticides to the underside of leaves, which is where the psyllid adults and nymph live. 3. Apply at least two or three applications of each insecticide, 7-14 days apart to kill all the nymphs because most insecticides will not kill eggs. 4. During the growing season, use insecticides from more than one Insecticide group. This is to avoid the insects becoming resistant to an insecticide group. Always complete a cycle of applications with an insecticide before using another. 5. 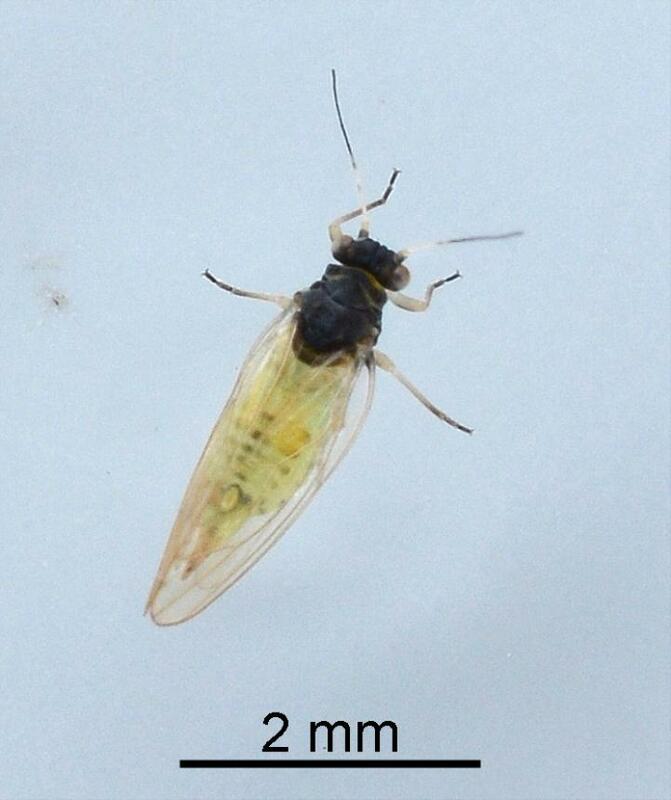 It is important to control psyllids on young plants as this stage is most affected by the psyllid yellows disease. 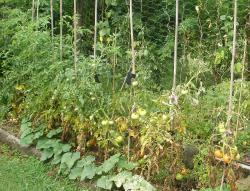 Older plants are still vulnerable to infection by the bacterium, but the fruit that has set will still be harvestable. See pesticide product labels for details of other pests controlled. Many gardeners prefer to use organic insecticide. None of these products are known to be effective, though oils show some promise for control of the tomato potato psyllid, Successful control of this pest using these products may require thorough spray coverage and regular applications. 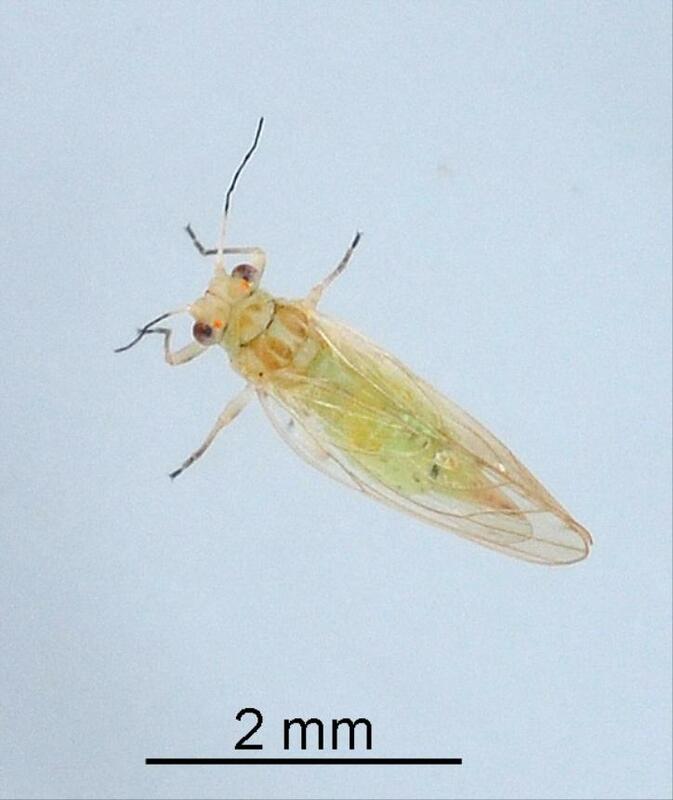 When the tomato psyllid was first discovered in New Zealand, the first question was “can it be eradicated?” The second question was “how did it get here?” An investigation by New Zealand’s Biosecurity staff concluded that the psyllid was most likely accidentally brought to New Zealand on smuggled goods, possibly chilli peppers from the West Coast of North America that carried late instar nymphs. MacDonald FH, Connolly PG, Larsen NJ, Walker GP. 2016. 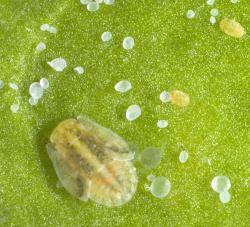 The voracity of five insect predators on Bactericera cockerlli (Sulc) (Hemiptera: Triozidae) (tomato potato psyllid; TPP). New Zealand Entomologist. 39 (1): 15-22. Martin NA 2008. 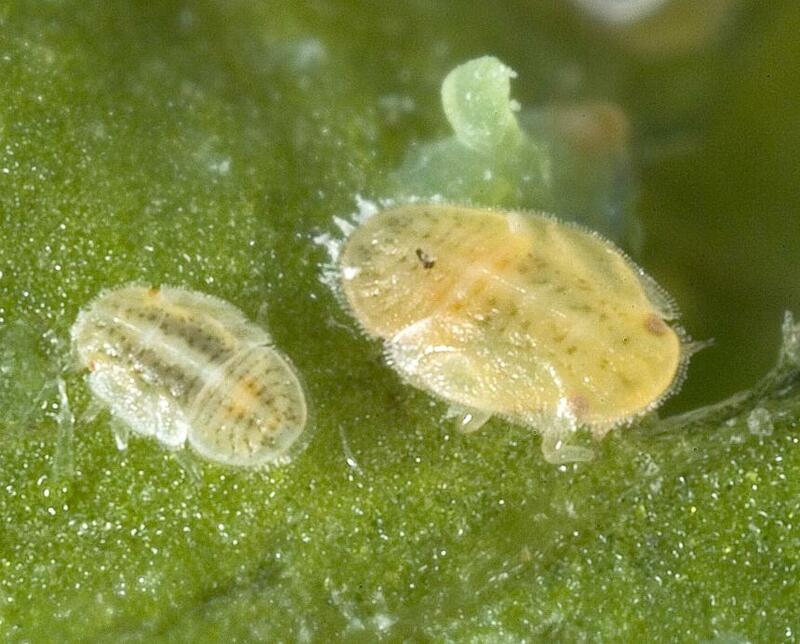 Host plants of the potato/tomato psyllid: a cautionary tale. The Weta 35(1): 12-16. Martin NA, Workman P, MacDonald F. 2007. 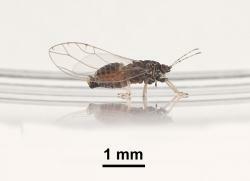 New prey records of the predatory native Miridae Sejanus albisignatus and Romna nigrovenosa (Hemiptera). The Weta. 34: 24-26. Munyaneza JE 2012. 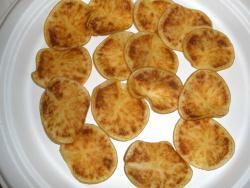 Zebra Chip Disease of Potato: Biology, Epidemiology, and Management. American Journal of Potato Research 89: 329-350. Pugh AR, O'Connell DM, Wratten SD. 2014. 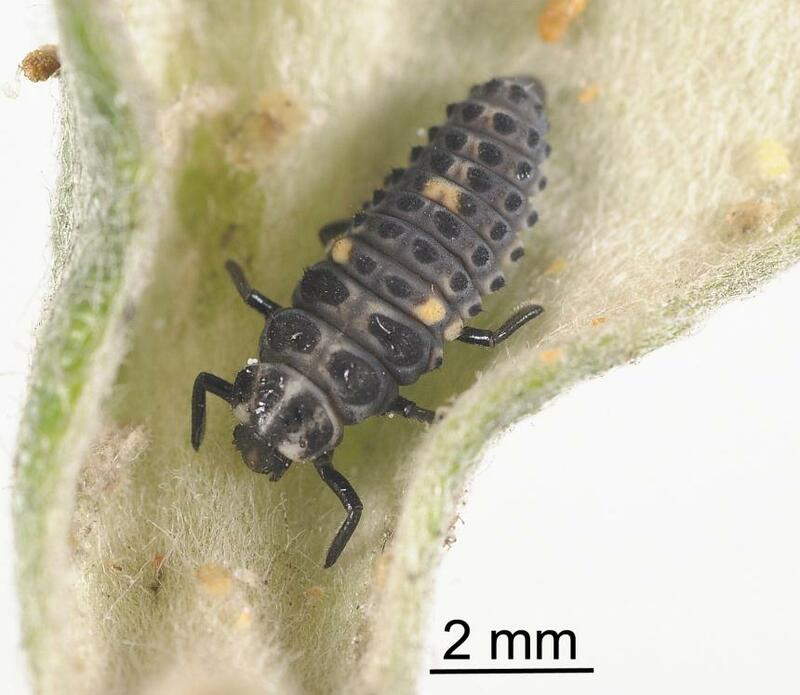 The southern ladybird (Cleora mellyi) as a new species association biocontrol agent of tomato-potato psyllid (Bactericera cockerelli). New Zealand Plant Protection. 67: 321. Robinson A, Knodel J, MacRae I. 2016. MANAGEMENT OF POTATO PSYLLIDS https://www.ag.ndsu.edu/extensionentomology/field-crops-insect-pests/Documents/potato/management-of-potato-psyllids-2016 (Accessed 2016 September). Sengoda VG, Munyaneza JE, Crosslin JM, Buchman JL, Pappu HR. 2010. Phenotypic and etiological differences between psyllid yellows and zebra chip disease of potato. American Journal of Potato Research 87: 41-49. Thomas KL, Jones DC, Kumarasinghe LB, Richmond JE, Gill GSC, Bullians MS 2011. Investigation into the entry pathway for tomato potato psyllid Bactericera cockerelli. New Zealand Plant Protection 64: 259-268. Tran LT, Worner SP, Hale RJ, Teulon DAJ. 2012. Estimating development rate and thermal requirements of Bactericera cockerelli (Hemiptera: Triozidae) reared on potato and tomato by using linear and nonlinear models. Environmental Entomology 41(5): 1190-1198. Walker GP, MacDonald FH, Larsen NJ, Wallace AR 2011. Monitoring Bactericera cockerelli and its associated insect populations in potatoes in South Auckland. New Zealand Plant Protection 64: 269-275. Walker GP, MacDonald FH, Puketapu AJ, Fergusson HA, Connolly PG, Wright PJ, Anderson JAD 2012. A field trial to assess damage by Bactericera cockerelli to early potatoes at Pukekohe. New Zealand Plant Protection 65: 148-154. Walker GP, MacDonald FH, Wright PJ, Puketapu AJ, Gardener-Gee R, Connolly PG, Anderson JAD. 2015. Development of Action Thresholds for Management of Bactericera cockerelli and Zebra Chip Disease in Potatoes at Pukekohe, New Zealand. American Journal of Potato Research. 92 (2): 266-275. Wallis RL 1955. 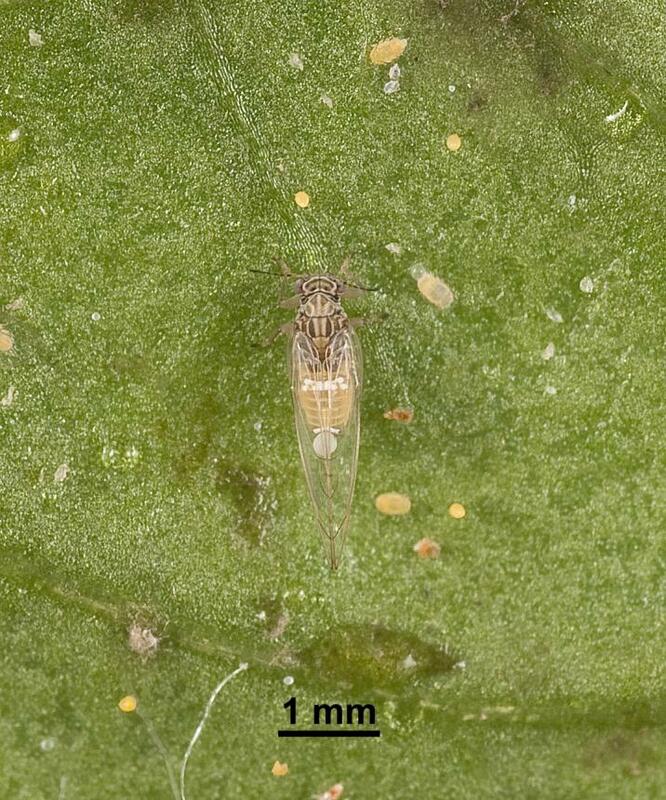 Ecological studies on the potato psyllid as a pest of potatoes. USDA Technical Bulletin 1107: 1-25. Xu Y, Zhang Z-Q. 2015. Amblydromalus limonicus: a "new association" predatory mite against an invasive psyllid (Bactericera cockerelli) in New Zealand. Systematic & Applied Acarology. 20 (4): 375-382. Yang X-B, Liu T-X 2009. Life History and Life Tables of Bactericera cockerelli (Homoptera: Psyllidae) on Eggplant and Bell Pepper. Environmental Entomology 38(6): 1661-1667. Yang X-B, Zhang Y-M, Hua L, Liu T-X 2010. Life History and Life Tables of Bactericera cockerelli (Hemiptera: Psyllidae) on Potato Under Laboratory and Field Conditions in the Lower Rio Grande Valley of Texas. Journal of Economic Entomology 103(5): 1729-1734. Pam Dale for psyllid identifications. Peter Workman for information about the psyllid, especially its natural enemies, and photographs. John Anderson for information about the effect of the bacterium on quality of potato tubers. Robin Gardner-Gee and Graham Walker for providing helpful comments and information about the psyllid and the bacterium. Andy Robinson, Extension Potato Agronomist NDSU; Jan Knodel, Extension Entomologist NDSU; Ian MacRae, Extension Entomologist University of Minnesota for helpful discussions. 1 June 2018. NA Martin. Non-insecticide controls, mesh covers added. Martin NA. 2016, revised 2018. Tomato potato psyllid - Bactericera cockerelli. Interesting Insects and other Invertebrates. New Zealand Arthropod Factsheet Series Number 60. http://nzacfactsheets.landcareresearch.co.nz/Index.html. Date Accessed. ISSN 1179-643X.